Scary Good Halloween Deals at Eat’n Park! Trick or treat! Halloween is just a few short weeks away! And at Eat’n Park we’ve got some scary good deals that are sure to satisfy ghouls and goblins in your haunted mansion. 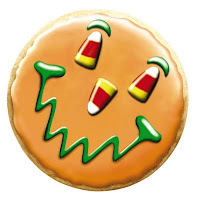 Halloween Smiley Cookies are on sale for just $6.99 per dozen! With candy corn eyes and a crooked smile, they’re hauntingly delicious! We’re also offering our Mini Smiley Cookies in Halloween colors for just $5.99 a dozen. And don’t forget that SmileyCookie.com has everything you need to prepare for your Halloween party, as well as individually wrapped treats for your neighborhood trick-or-treaters, and specialty Halloween gifts to send to family and friends. Click here to check out our selection.